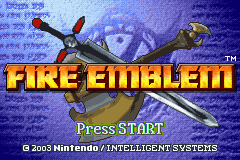 Fire Emblem Corrupt Theocracy is a Fire Emblem 7 mod/hack. It contains custom events, a new story, and some new maps and mugs. All characters and weapons have been changed, and some new weapons and classes have been added. 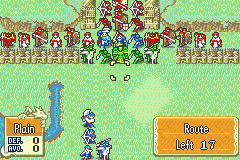 The Hack is split into two parts: Part One (Lyn Mode) and Part Two (Eliwood Mode). Part One is 9 chapters long including the prologue. It has 15 characters. It is meant to be fairly easy, and your characters generally greatly out level your enemies. Only the last two chapters should pose any difficulty. The Story has you follow the prince of the Fire Clan of “Repub”. His name is Eli, and he is the Commander of the countries border patrol. The story of part one starts with Eli on any regular old border patrol mission: Killing the bandits from Merc who have come into Repub. Everything changes though when it turns out that the group they attacked are actually working for Holy and are traveling with a True Dragon hostage. 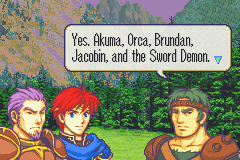 Of the characters found in Part One, nine return as playable in Part Two, but only one of them has their part one stats affect their part two counterpart. It is 23 chapters long with 54 playable characters. Three of them are only available for the final chapter, and two are “Secret Characters” a la Stefan. Not all characters have support convo’s. 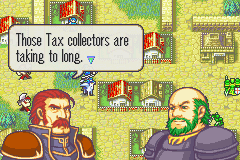 Instead, they have in chapter convo’s with a couple of characters a la FE4. 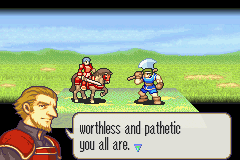 There are some characters who have supports, but have no support convo’s.